Sometimes when pressure is high in your turbo system when you join hoses onto tube you can still get hoses "popping off" under pressure. 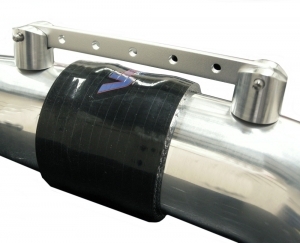 Although all of our aluminium pipes come with Roll Beaded ends to prevent hoses slipping or "popping off" , in some cases pressure is so high that even the tightest fitted hoses, good clamps and beaded ends on pipes do not sufficiently retain hoses in place. Hoses "popping off" during racing or during use can be bad news! To prevent this Viper Performance has designed a new bracket specifically to prevent this form ever happening. Our unique bracket is unavailable anywhere else in the UK and offers a cost effective solution where you simply cannot afford hoses "popping off". Our lightweight brackets are made of 6063 Billet aluminium, simply weld the flat seat of the feet onto your aluminium pipes, adjust the length of your bracket, and presto ! hoses will never come off again. What's more is that thanks to our very clever quick release pin, you can remove your installation in a second with no tools! 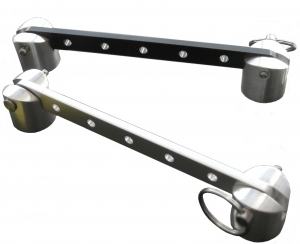 Our brackets comes complete with feet and bar, and is available in anodised black bar, or polished options.